The upside of my running injury (groan, am I still on about that? ), is that I was forced to look for alternative cardio activities. One of my options was to learn swim better, with goggles on and head down in the water, working on my bi-lateral breathing. Now I'm in the pool a couple of times a week, regularly getting through 50 lengths and on the verge of upgrading my beach bikini to an actual proper swimsuit (only because I had a Babs Windsor 'Carry on Camping' moment the other day - eek!). Soon I might even look like a real swimmer. Wear a helmet, even if it does mess with your hairstyle as this can really lessen the impact of a head injury. Leave your headphones at home and don't talk on your mobile as you ride. It’s important to be aware of your surroundings when cycling. Have bright, functioning lights and wear high-vis clothing, particularly at night. Be vigilant around parked cars as well as moving ones. Passengers often get out of cars without looking, and collisions with opening doors can do a lot of damage. Be aware of the large blind spot that HGV drivers have, and do not cycle up the inside of HGVs or sit just in front of them at traffic lights. They will not be able to see you there, and this is the biggest cause of fatal accidents. A recent ride - including 'Devil's Hill'! And so, now if the sun is out, and the pool is timetabled for an aqua class, you might just find me peddling past on my way to a hill (well, a steep slope then). 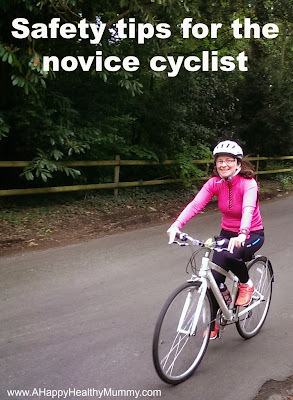 I'll be wearing my bright pink top and a helmet, my mobile has been surgically removed from my hand and is instead hidden in a waist bag (and switched to MapMyRide) and I'm thinking about those other road users and potential hazards they may bring. So far so good! Do you enjoy biking? Are you an on- or off-road type? How confident do you feel on the roads and around traffic? Let me know in the comment box below. I am a real wuss these days when it comes to cycling on the roads (even though I spent my teenagehood cycling everywhere). I think I probably need to get my bike serviced before I hop on it again as it has been so long since I used it. But as the kids get more into the cycling I might have to do something about it! Yes a roadworthy bike is a good place to start! I think local councils have started doing 'bike ability' courses for adults too (like the old cycling proficiency test). I really need to look into that!!! Step away from the black leggings!! !